Creating a healthy rhubarb muffin is harder than you would think. Typically, rhubarb needs the addition of a ton of sugar for people to like it. I have told everyone how much I love rhubarb. This being rhubarb season, I am celebrating its arrival. The most popular rhubarb recipe on Snack Girl is my light rhubarb crisp. It is SO easy and delicious and many have thanked me for the recipe. I created this low sugar rhubarb bar last year, but it didn’t take off. It might have been a little too much work. Baking has never been one of my best talents. I have struggled with dry cookies, dense bread, and pancakes that taste like cardboard. Since I try to make healthier baked goods, I struggle with the amount of fat and sugar in most recipes. If you leave out too much fat, the baked good lacks moisture. When you reduce the sugar, it can lack flavor. I decided to try to put rhubarb in a baked good to see if it worked. Walnuts and rhubarb seemed like a great combination – the buttery walnut and the sour rhubarb seemed a good match. These are HANDS DOWN the best muffins I have ever made. I have created many a muffin for Snack Girl and baked a bunch from other recipe books and I love these. Maybe after years of practice, I can finally say that I know how to bake. These are special and would be wonderful at a brunch or any other happy occasion where muffins are desired. Have you tried to put rhubarb in a baked good? How did it turn out? Preheat oven to 325 F. Put muffin liners in a 12 cup muffin pan. Mix flour, sugar, baking soda and salt in a large bowl. Mix in vegetable oil, egg, buttermilk and vanilla until just mixed and fold in rhubarb and walnuts. It is there waiting for you in the produce section - rhubarb! Thank you!!! I know the problems you describe and am thrilled that you have developed this recipe. THRILLED!!! 1 stalk of rhubarb is a funny amount, given the way it grows....the combo with walnuts is really a great idea and adds to the healthiness. My family will expect plain old whole wheat pastry flour. I'm sure it will be fine--it always is!! Thanks again. I think it would have been better to say cups of Rhurbarb because the stalks come in various lengths. I did not see any Rhurbarb at my local farmers market yesterday, darn. I love Rhurbarb my favorite way is to rinse, cut, peel the string edges off, then CHOMP! No sugar for this tart taste lover! I LOVE rhurbarb and can attest that the rhurbarb crisp referenced is GREAT! I also love to stew it with a little bit of raisins (for sweetness), water and just a tad of sugar. Can't wait to try the muffins! I love when Rhubarb season comes around and you come up with another great recipe. I'm all about muffins so this would be perfect except I was wondering if I could use Oat flour or a mixture of Almond flour and Oat flour? Do you think it would work? Thanks again for the great healthier recipes! Here in Lancaster PA there is a place called Kitchen Kettle. Every Year there is a Rhubarb Festival. Everything you might want they have. This year it is on May 19. 2017. This also a neat place to shop-lots of little speciality shops. 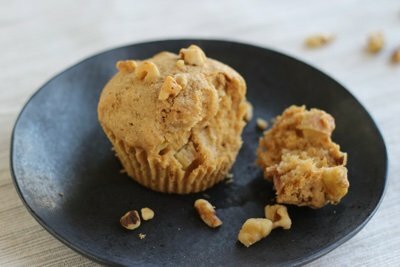 I am planning on making these muffins as soon as I have all the ingredients. I will have to leave the nuts out. Any suggestion on a substitute. GREAT muffins! I am not a big rhubarb fan, but my husband is so I thought I would give these a shot- still hesitant they would be too tart- they are amazing, my 3yr old and I would have eaten them all before hubby got home from work if I had not pre-packaged them as soon as they were cool! I made a second batch, swapped the wanluts for pecans, threw in a couple diced strawberries & sprinkled chopped nuts & sugar on the tops before baking for an additional crunch! My daughter called these cupcakes & I am becoming a rhubarb convert (at least cooked this way!) thanks again Snack Girl! I was super excited to make these muffins, since I adore the sweet zingy flavor of rhubarb. The rhubarb and walnuts were tasty indeed. The thing that bothered me about this recipe was the texture. 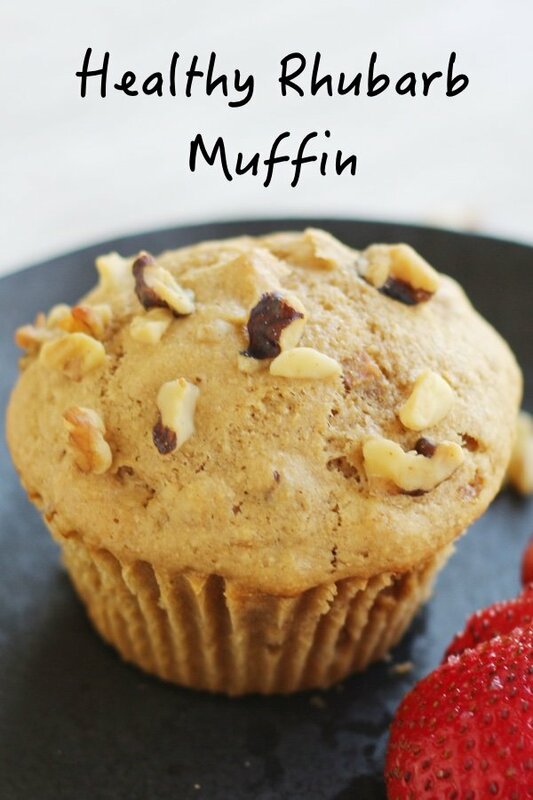 I like muffins with a cake-like, crumbly texture; this texture reminded me more of play doh. Thanks for sharing this recipe, but I think I'll like the rhubarb crisp better. These muffins are delicious! Not too sweet. These are terrific! 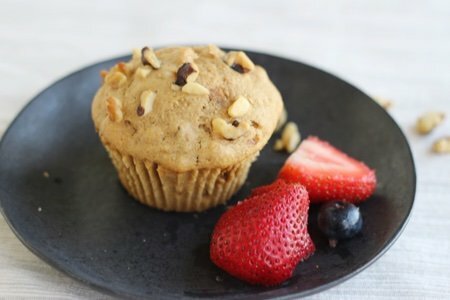 I’ve made a lot of muffins in my day and these are terrific! I served them with strawberry rhubarb jam. Not necessary, but yummy.